Developed by Natural Skin Care and Wellness expert, Dr Maria McGee, these unique skincare and wellness products are part of Marble Hill’s range which use only premium natural ingredients selected from around the world for their unique properties. Based in Northern Ireland and having our very own natural spring water from our well in Co.Donegal, Marble Hill develops and manufactures a range of unique and luxurious skin care and wellness products that are 100% natural and have proved beneficial to the wellbeing of our customers. Testimonials show that our skincare range is also used in alleviating the irritation caused by skin conditions such as Dermatitis, Eczema, Psoriasis, Athletes Foot, Dry Skin, Acne, Dandruff and other skin malaises. Continually researching the development of new products to expand the benefits of Dr Maria McGee’s Pure Natural Skincare and Wellness to an ever increasing customer base, we sincerely wish to have a genuinely positive impact on the wellbeing of all those who choose to buy our products. We absolutely guarantee that our entire range is completely 100% Natural. We guarantee that none of our products or ingredients we use are ever tested on animals, Marble Hill actively campaign against animal cruelty in all its forms. Unlike some other companies or individuals selling ‘so called natural products’ we can confidently and categorically state that there are no chemicals, additives synthetics, fragrances or colorants’ or any other type of cosmetic or man made ingredient in any product we produce. Our ingredients come from sustainable and fair trade sources. Do you know where companies are trading from? 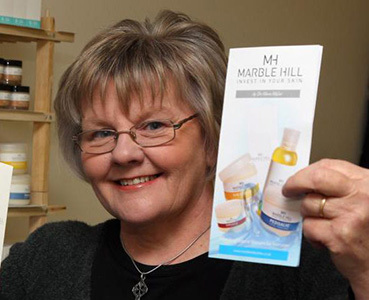 Marble Hill is firmly based in Northern Ireland with ownership of property in Co, Donegal, (where our well is situated) we can be easily contacted during business hours for any queries or advice on use of our skin care range. We do ask you to carefully consider who you are dealing with when considering Natural Products. Even some of those with large budgets that enables them to mass mail-shot the public with glossy brochures, promising all sorts of miracle benefits, must be closely scrutinised as to their veracity. Of course, there are a few companies who like Marble Hill do actually produce ‘real’ natural products, and do not need to make outrageous claims to honestly market their range. Here at Marble Hill we try to promote our range of skin care and wellness products in as honest a way as we can. Even though we fervently believe that there are additional life-enhancing benefits to be gained from use of our range, other than those that we publicise, we leave it to our customers who actually gain from these benefits to tell others about them. A large proportion of our business is built on old fashioned recommendations (word of mouth) and that’s something we are extremely proud of.